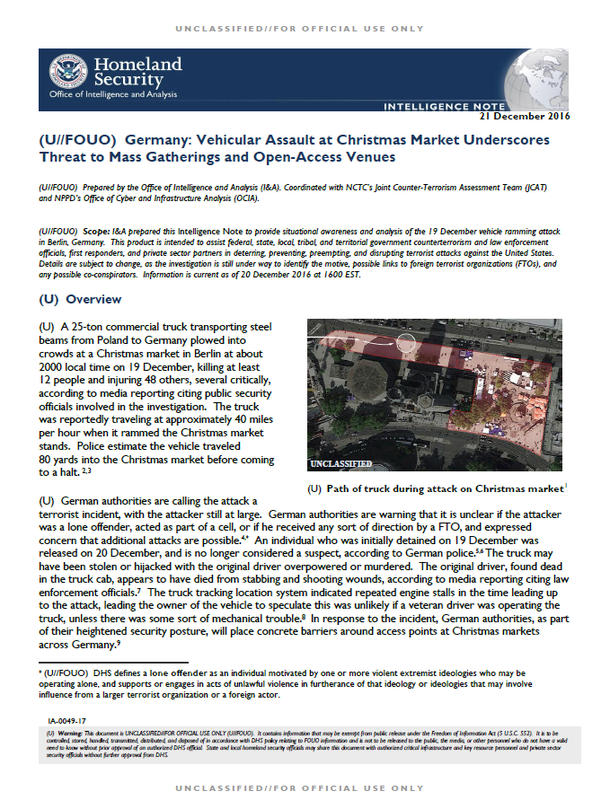 (U//FOUO) I&A has no information indicating a specific or credible threat against individuals, locations or events in the Homeland, but several recent plots and attacks in the United States and overseas involving shopping malls, mass transit, and mass gatherings, including sporting events, have shown that homegrown violent extremists (HVEs) and terrorist groups are interested in attacking these types of targets. I&A assesses that commercial facilities—such as festivals, concerts, outdoor events, and other mass gatherings—remain a potential target for terrorists or HVEs, as they often pursue simple, achievable attacks with an emphasis on economic impact and mass casualties. The most likely tactics in a hypothetical terrorist attack against such events likely would involve edged weapons, small arms, vehicular assaults, and possibly improvised explosive devices. The 19 December events underscore the difficulties the private sector and law enforcement face in securing venues that are pedestrian-friendly, particularly in light of the large number of such areas.